There are new bags on the website this month, including a few limited edition Elsie Day Bags. Featuring limited edition tweeds, some from the now closed mills in the north of Scotland, others from further afield in the UK. These limited edition tweeds will never be repeated, once they’re gone, they’re gone, which only adds to their exclusivity. 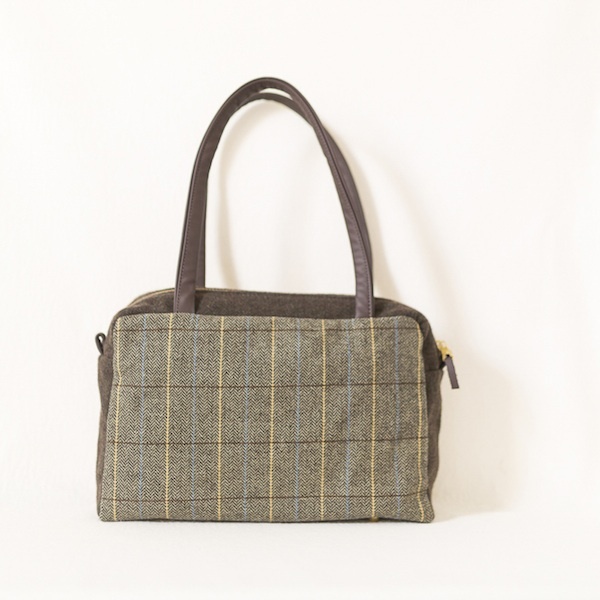 Combined with tweeds from the borders and the islands, the Elsie Day Bag perfectly showcases the diversity of colour, texture and pattern in British tweed today. The comfortable shoulder straps are made from high quality Scottish leather, and the zip closure is extra chunky to contrast with the soft textures of the body of the bag. All Elsie Day Bags feature the three layer construction technique, meaning quality and durability are never compromised. The Elsie Day Bag also has an extra layer in the base for added strength, and four metal feet to protect itself from mucky surfaces. The lining is made from organic cotton hemp and hand printed in our bespoke Katherine Emtage design. It also features two internal pockets, one patch and one zipped, for keeping small items handy. The Elsie Day Bag is the perfect balance of timeless style and contemporary design, and the ideal bag to use everyday, from season to season. This entry was posted in Products and tagged bags, Borders Tweed, Elsie Day Bags, Harris Tweed, limited edition tweed, tweed.